A good girlfriend forces you to expand your cultural horizons, make good decisions, meet new people at fancy parties, read stuff, and wear clothes that don't stink of defeat. While you may not have the looks for a girlfriend, you're certainly attractive enough for a beer: Beck's. 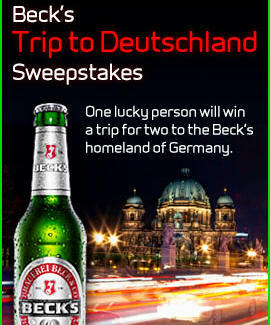 Beck's has been satisfying the good people of Bremen since 1873; in the spirit of Oktoberfest, they're giving you a shot at a roundtrip for two to Germany, a land so wondrously sudsy, bad beer is forbidden by law ("Reinheitsgebot" -- enforces beer purity, though it sounds like a Transformer with an uncompromising taste in beverages). Win, and you'll get seven days of hotel accommodations in your city of choice: Bonn, Munich, Frankfurt, or Berlin (better luck next time, Bad Homburg vor der Höhe). Before takeoff, Beck's will even hand you a check for $3000, which you're free to spend on fabulous meals, fabulous historical tours, or your fabulous mortgage. As for those good decisions a girlfriend'd normally force you into, hit the Beck's Universe of Choice: hundreds of tricky situations (cover for your boss, or tell his hot wife he's cheating? Al Green or Dave Matthews to close the deal? ), plus polling results from thousands of Beck's drinkers (winner: Al Green). Join the Key Club, and you'll also get access to special events, exclusive content, and free Beck's gear -- because the first step towards being more attractive, is being less naked.